I posted back in December about how I aspire to be a reader. I've always been the person to opt for the television over a novel, but I really wanted to change that! I've been reading here and there and can honestly say I am thoroughly enjoying my new hobby. I had to read some books that just killed me with boredom back in high school, and that really took away any desire I had to read. Charles Dickens was brilliant, yes, but I jut can't get into his books. I selected a few books to start that I thought I might like, and I loved them! Moral of the story: just because your high school English teachers made you read books barely written in English does not mean all books are unenjoyable. 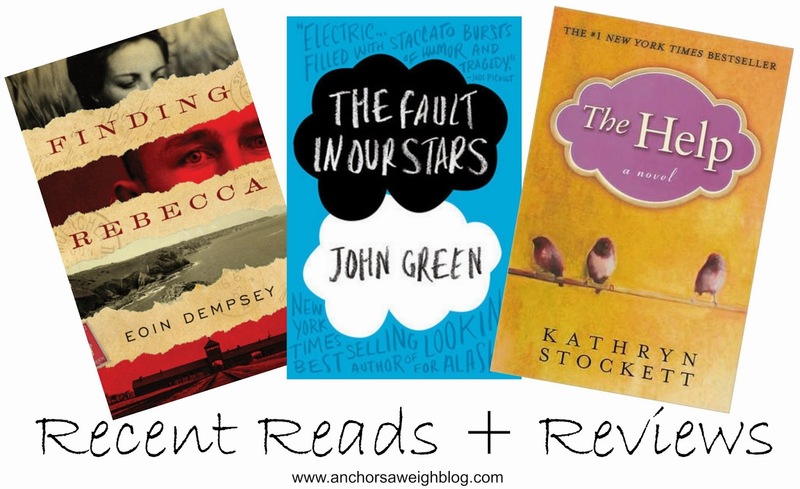 I thought it would be fun to share my reviews and recommendations on my recent reads, so this is the first round! I will review 3 books each time and would love to hear your suggestions on which 3 books I should read next! I got with the program and signed up for a goodreads account, so I am adding books to my list daily! Summary: This novel is set in WWII and centers around an unrelenting love between Christopher and Rebecca. Rebecca is Jewish and Christopher is German, but both live and fall in love in New Jersey. When Rebecca is taken to a concentration camp and Christopher is deported back to Germany at the start of the war, Christopher volunteers for the Nazi SS as a desperate attempt to save the woman he loves. Christopher is placed in Auschwitz, and he struggles to maintain his cover but also his humanity and love for people as he continues to search for Rebecca. My Thoughts: I read this at the recommendation of my sister because World War II history has always interesting to me. I really liked it. It was a quick read but man it tugged at my heartstrings. Reliving the reality of what people went through at Auschwitz is gut wrenching and eye opening. I gave it 5 out of 5 stars and highly recommend it if historical fiction is your cup of tea! Summary: Hazel has battled cancer all of her life. She is living on borrowed time and attends support group at the persistence of her mother, even though she thinks it's totally pointless. When the cool and handsome Augustus Waters appears at cancer kid support group, Hazel's world is changed forever. My thoughts: I could not put this one down. It was definitely my favorite read so far. The characters' personalities are so well written, and it will have you feeling every emotion on the spectrum. I cannot recommend it enough! 5 out of 5 stars for sure. Summary: Set in the 1960's, this novel gives you a look into two worlds: the world of the privileged white women and the world of their housekeepers, or the help as this book calls them. Skeeter is a white woman who would rather write than become a housewife. Aibileen is a black maid who has cared for so many beautifully innocent children that all grow up to be just like their entitled mothers. Minny is an opinionated, confrontational black maid who can cook better than anyone but can't learn to keep her negative thoughts to herself. Seemingly very different, these three come together for a project that will put them all at risk, but could change their lives and the way the world views their roles forever. My thoughts: I really liked this book as well. My only complaint was that it felt long. I think because the chapters were longer than most, this book took me a while to get through. This is a book that will have you thinking about the characters in the middle of the work day. I gave it 4 out of 5 stars because it got a little long-winded in the middle, but otherwise it would have been 5 stars. It's an excellent story that I highly recommend to anyone and everyone. So that's it for this round! Any recommendations on what to read next? Anything by Jane Green or Emily Giffin, I love them!!! Something Borrowed by Emily Giffin! The Help is one of my favorite books! :) The movie is great but it doesn't compare to the book at all. I totally saw the ending of TFiOS coming, so I didn't cry a single bit. The Help was quite long... I listened to the audiobook version when I was commuting an hour to work each day. I loved The Help! Such an awesome book! My suggestion is One For the Money by Janet Evanovich.